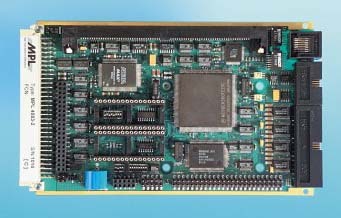 The MPL4083 is a highly integrated all-CMOS single board computer with 3U form factor. Built around the MC68360 32-bit controller, the MPL4083 is well suited for applications requiring high performance communication and data management capability with great flexibility. Implemented on board the MPL4083 are all major components used to build a complete and sophisticated Host system. It features an SCSI-2 interface for mass storage devices, two types of Ethernet interfaces, an opto isolated CAN interface, various serial interfaces and several types of memory. The MPL4083 can be further customized with the use of M-Modules. The board also supports a full 16-bit G-64/96 bus interface for I/O and memory extension. The fully CMOS architecture draws a mere 500mA on 5V. This makes the MPL4083 the ideal choice for any low-cost embedded-control applications, ranging from control, communication, data acquisition and management activities to portable microcomputer applications. The 68EN360 from Motorola is a versatile one-chip integrated microprocessor and peripheral combination that can be used in a variety of controller applications. It particularly excels in communication activities. The processor core is the 32-bit version of the CPU32 and is based on the 68020. Calculating power is about 4.5 MIPS at 25 MHz. An integrated PLL circuit allows to select almost any frequency up to 25 MHz (33 MHz optional). Additional power saving options give full flexibility in power critical designs. Four 16-bit timers, two DMA channels and integrated modules like bus monitor, watchdog and periodic interrupt timer are also part of the integration. The base of the communication module is a RISC controller. It independently supports the six serial channels with different protocols as there are: Ethernet, HDLC/SDLC, UART, BISYNC, V.14, X.21, Profibus and more. The autonomous serial DMA allows for high speed connections to these serial ports. As an extra, unused port lines can be used as general purpose I/Os. The Background Debug Interface is available via a 10-pin connector (Motorola pin-out). The MPL4083 comes with two 32-pin JEDEC sockets for up to 2 MBytes of BootROM (16-bit wide) which allows to install any type of real-time operating system and/or application. Battery protected SRAM of up to 2 MBytes is soldered directly to the board. 128 Mbytes of DRAM can be installed on the 32-bit wide 72-pin SIMM-socket. This is enough even for the most complex real time application. As an option, up to 2 MBytes of 32-bit wide FlashROM may be used to store application specific code. On-board programming is supported to simplify installation and updates of the User code. External mass storage devices such as hard disk and floppy disk can be connected to the SCSI-2 interface. The interface is terminated with an active termination and uses a standard 50-pin header. The SCSI-2 channel is supported by DMA and allows for data transfers up to 5 Mbytes/sec. The Ethernet interface allows for two types of LAN connections which, however, cannot be used in parallel. A Twisted Pair connection (10BaseT) can directly be established via an on-board RJ45 connector. The Cheapernet implementation (10Base2) is prepared via an AUI compatible cable connection and requires additionally an external Cheapernet transceiver. The MPL4083 is shipped pre-configured with the Ethernet address (in a serial EEPROM). The Ethernet interface is supported by local DMA and reaches a data transfer rate of 10 Mbits/sec. The remaining five serial channels of the 68360 are implemented as RS232 interfaces. They are partly User configurable which means that all lines not used for the RS232 interface (except RxD / TxD of SMC1 and 2) can be defined to function as TTL I/Os. A field bus connection can be implemented via an optional CAN bus interface (ISO/DIS 11898). The interface is opto isolated and allows for data rates up to 1 Mbit/sec. Up to 27 TTL I/Os are available at the front connector. Unused port lines and (almost) all lines not used for the RS232 ports are available for free use in the system. The MPL4083 offers a full implementation of the G-64/96 interface. This opens access to numerous G-64/96 compatible products and therefore allows for a flexible I/O and memory extension. Internal logic provides control over some features of the G-64/96 interface. One standard mezzanine M-Module slot permits local extension with graphics, process I/O, motion control, interfaces, analog circuits etc. More than one hundred modules with all kind of functions are available. The M-Module is mounted to the CPU board by using bolts. A mounted M-Module uses a second slot in a rack system. All on board/external interrupt sources (G-64/96, SCSI, M-Module and CAN, RTC) are programmable to be vectored or auto-vectored. The level of the on board interrupt sources can be changed by software. Software development on the MPL4083 is simplified by the availability of the OS-9 V3.0 real-time, multitasking operating system. The integration includes drivers for each on board function. For further details see MPL408X-DEV. Separate 1kWord spaces for VPA synch./asynch. LEDs for Power, Halt/Reset and SCSI Term.